While helping Neal with Basement Studio activities is now the main focus of Coleen’s energy, she still finds time to escape to her own studio space once in a while. 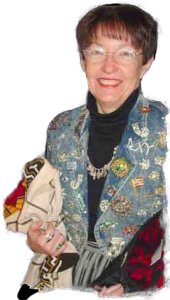 Coleen has designed art to wear and wall quilts for over 40 years. Her focus is based in tradition but incorporates contemporary design and embellishments. Her business, Coverings, was well known in the quilting world for almost 15 years. 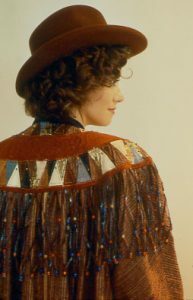 Along with partner Diane Herbort, they provided adventurous quilters with supplies that were very hard to find…unusual fabrics, beads, buttons, fancy trims, fancy yarns and threads…they were always on the leading edge, making specialty products available that regular quilt stores were reluctant to stock. Her teaching credits include the International Quilt Festival, Quilt Surface Design Symposium, National Quilting Association, Mid-Atlantic Quilt Conference and Quilter’s Heritage Celebration, as well as numerous guilds and stores. Her designs have been featured in several national magazines including McCall’s Needlework and Crafts, FiberArts, Country Handcrafts and Quilter’s Newsletter Magazine. Many years of living abroad influence her use of unusual fabrics and the art and architecture of other cultures frequently provide design inspiration. Coleen’s work has been exhibited widely and was shown at the International Quilt Festival in Houston, TX; Visions, Museum of Man, San Diego, CA; Art Barn in Washington, DC; Montpelier Cultural Arts Center, Laurel, MD; Paducah Art Gallery, Paducah, KY; Park Avenue Atrium, New York, NY; and in the Fairfield Fashion Show which traveled internationally. She was an Artist-in-Residence at Glen Echo National Park in Maryland and a member of FiberWorks at the Torpedo Factory Art Center in Old Town Alexandria, VA.